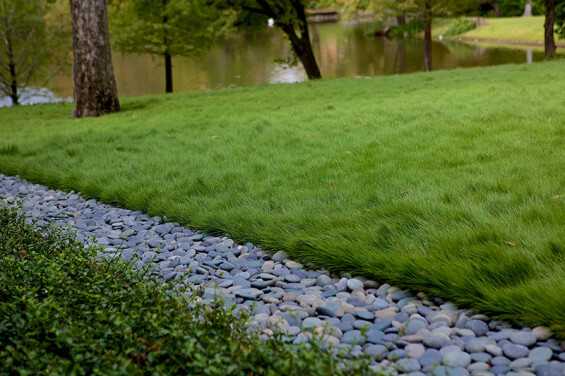 This landscape design is an example of harmonious relationships between structure and site. The project emphasizes a desire by the client to master plan the site to enhance the landscape surrounding the existing house and incorporate a new studio, sited for long vistas to the adjacent pond. 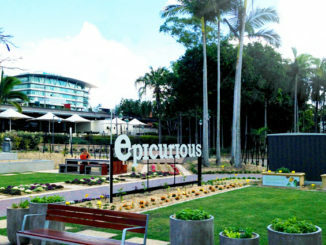 The holistic approach allowed the design to focus on lush flora to create a unique inner-city panorama. The contemporary buildings and garden relate to one another gently through the careful manipulation of architectural elements that are intentionally eroded by the introduction of lush plant material. 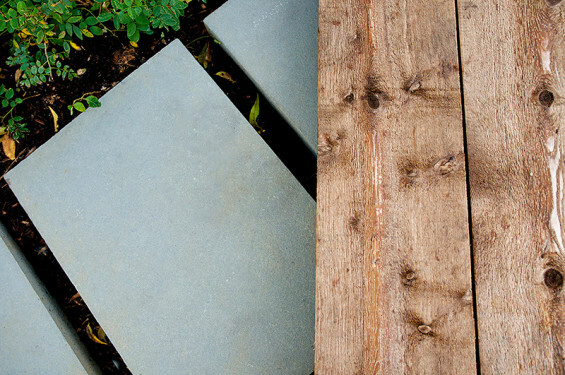 The resulting patina created along the hardscape elements ties hard to soft, architecture to garden through subtle, ethereal connections. The existing native trees and vegetation were catalogued and used as a starting point for intensive planting. Strong seasonal interest keeps the garden colorful and full of visual interest year round. Much of the garden design originated from studying the views from inside the house with selective use of plant material for screening. 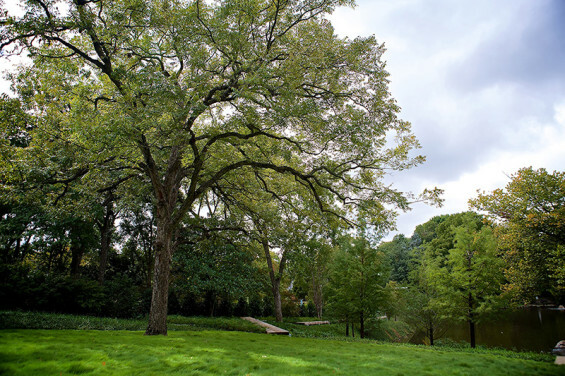 The reforestation of the site came through the careful siting of new native overstory and understory trees, and masses of woodland plantings that subtly screen the home from the street and adjacent neighboring properties. 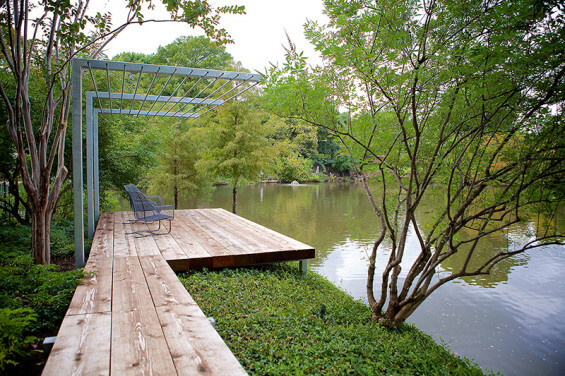 A clear overstory and understory help to ground the house while providing a sense of privacy. A continually evolving view into nature is create. Seamless transitions between the interior and exterior of the studio were extremely important. 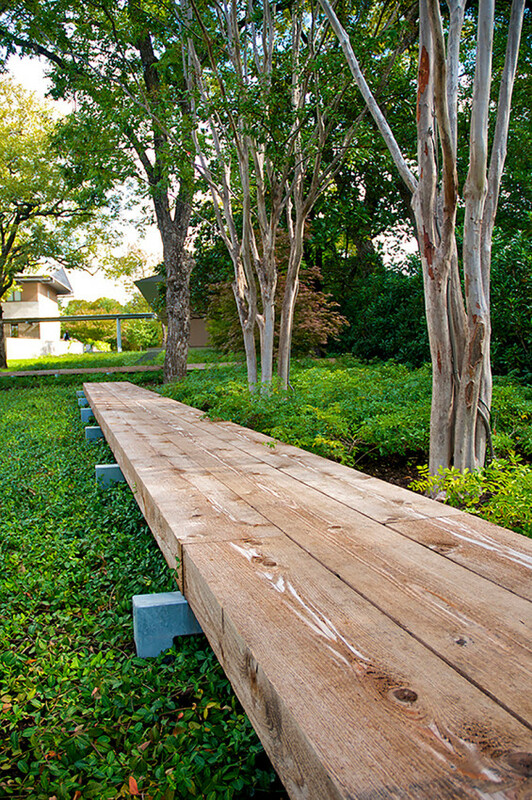 Steep topography between the studio and the pond created an opportunity for a woodland, plant-filled procession. Large cut bluestone blocks become connectors throughout the site and provide transition between spaces. 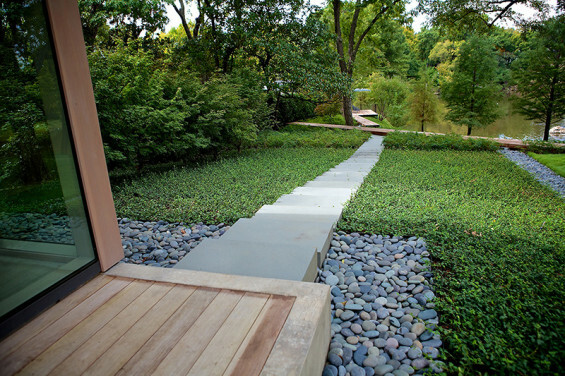 The ribbon of steps journey down the terrain toward the pond, interrupted by a boardwalk system. Inspired by traditional Japanese paths, the boardwalk system zigs and zags across the site. 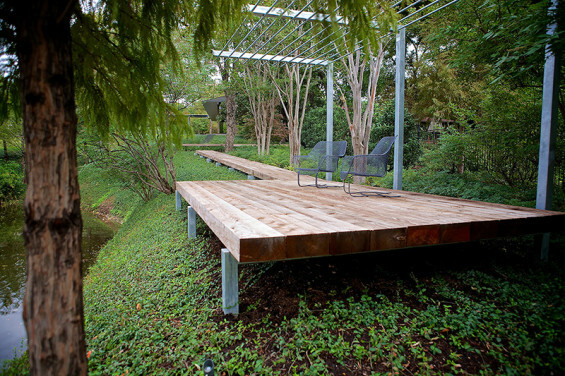 The elevated walks consist of heavy wood timbers spanning galvanized steel footings. The timbers will continue to weather to a beautiful silver gray, creating subtle contrasting lines in the garden. A minimal plant palette creates mass plantings used for large textural impact and privacy screening. 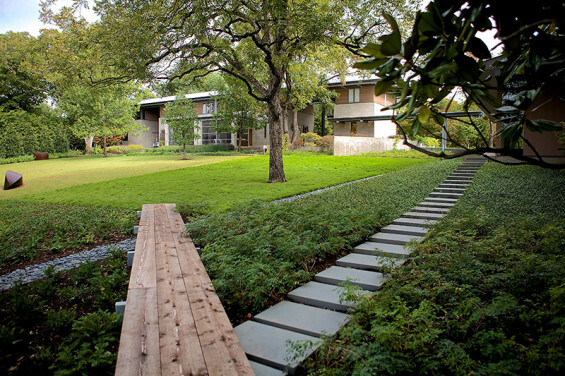 Monoculture blocks of planting cradle the stone steps as they descend the slope, while an adjacent area of unmown zoysia lawn accentuates the original runnel system that carries rainwater from the home’s roof to the pond. Both types of plating aim to mitigating the rate of rainwater flow and prevent erosion as the water follows the slope to the watershed below. An opportunity to create a small intimate terrace presented itself in an unused space at a naturally occurring point at the far edge of the property. 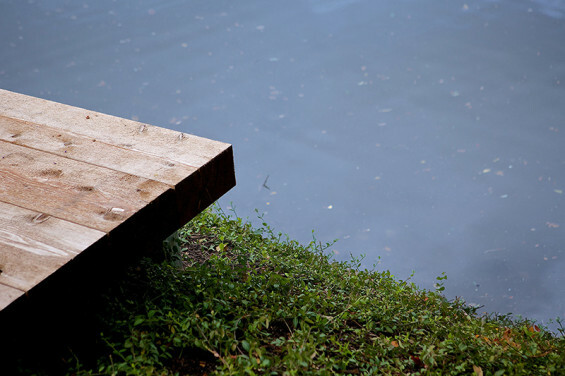 The boardwalk ends at the timber-necked terrace floating on the steep grade above the pond. A small galvanized steel trellis comprises the space to create an implied ceiling, allowing for perceived shelter tucked into a more intimate space. The space is minimally furnished. The view is sited for gazing across the pond. A thoughtful design process was used throughout in order to detail every element with care.